Whether you're developing spelling lessons for primary students, high schoolers, or ESL learners, there are some common spelling strategies you can use. We've compiled some of the best ideas right here! For maximum benefit, customize our spelling exercises, homework ideas and teaching tips to your own situation. And remember to "pay it forward." Share these resources with other parents and teachers! NEW! 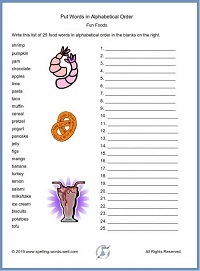 Put Words In Alphabetical Order with this pair of engaging worksheets. The first list features 25 fun foods that must be alphabetized by their first and second letters. The second page requires students to look at the third and fourth letters in a list of five letter words that all begin with W. Challenging! Practice Spelling Words Follow these tips and techniques to master your weekly spelling words, or any list of spelling words. 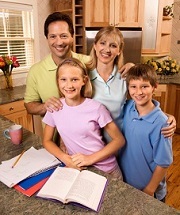 These ideas work for all ages, especially if the speller has a family helper or study buddy. 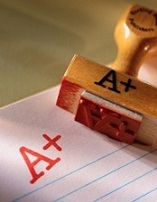 Associates Degree Abbreviations - See our list of common Associate and Bachelor Degrees. Learn how to use them properly in your writing. Word Abbreviations - A list of many of the most common abbreviations used in English, along with helpful tips for using them correctly. Common Core Standards - Lots of our games, worksheets and teaching ideas are now aligned to the Common Core State Standards. See our list. 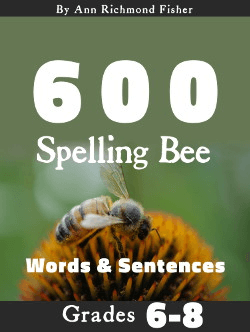 Here are two fun ideas to put some pizzazz into your weekly spelling bee quizzes. Try these spelling test games this week! 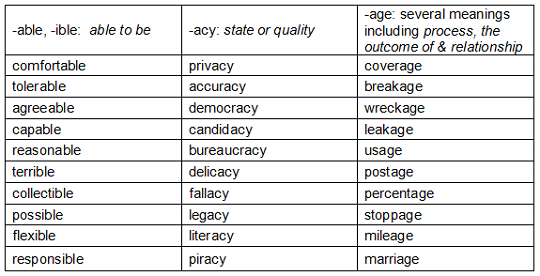 List of Suffixes We've compiled a long list of the most commonly-used suffixes. We've also include the meaning and 10 example words for each suffix. Spelling Exercises - Ready-to-use sentences for students to copy from the board. Use ours, then follow this format to make more of your own spelling exercises. How to Teach Spelling - Teachers, start here! We provide key guidelines for anyone who is trying to teach spelling, regardless the age of the student. Homeschool Spelling - Simple ideas to add some fun to your spelling routine. 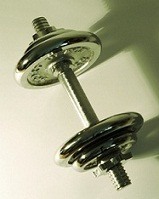 Try something new this week! Invented Spelling - A quick look at both sides of the debate on invented spelling vs. conventional spelling for early learners. Puzzle Partners - Ideas for partner activities that enable 3rd-6th graders to work together and learn to spell well! 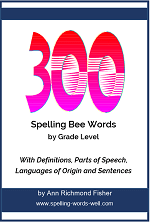 Spelling Bee Quiz - Identify the misspelled word, spell it correctly and find your score! Step-by-Step Lesson - This lesson methodically teaches when to double, and when not to double, the final consonant when adding suffixes. Building Spelling Skills - Tips for helping upper elementary students to boost their spelling performance. Teaching Tips for Problematic Words- Great for 6th grade, or any grades 4 through adult. Specific ideas for learning tricky words. 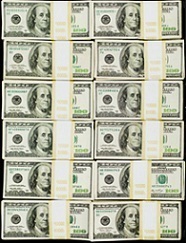 A lot of money, not alot of money! alot of money vs a lot of money. Spelling Strategies - Students who master these ten spelling rules/strategies are sure to become better spellers! We clearly state the "rule" and provide examples of words spelled correctly when following the rule. "I've been teaching ESL to adults for about 15 years, and last week a student asked if I could help him improve his spelling. ...I told that student I'd see what I could find. And that's how I came upon your website. What a terrific resource it is! Thank you SO much! I plan to include lots of your materials in my lessons from now on." Thanks for writing, Janice. Please feel free to contact us, too!